These 80lb classic natural white Neenah classic laid paper covers have a unique laid texture reminiscent of handmade paper. Neenah classic natural whiteclassic laid papers are acid free, carbon neutral, and contain post consumer fiber that can be used with your laser printer, inkjet printer, color copier, or color printer. We also offer theseclassic natural white covers pre-punched in the binding pattern you prefer (see list below*). Our window covers have a 1.75" x 4" window that is centered on the front cover 3" from the top edge. 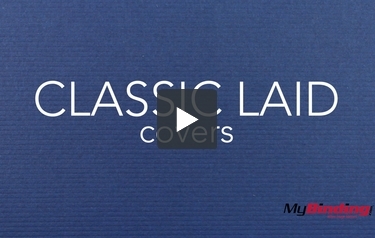 Be sure to select the right cover given the fact we carry nearly 200 varieties of our Classic Laid paper covers.